The last of the Protectobot Deluxes, and in my opinion one of the best Deluxe molds to come out of Combiner Wars. Let’s take a look at Combiner Wars Protectobot Rook! 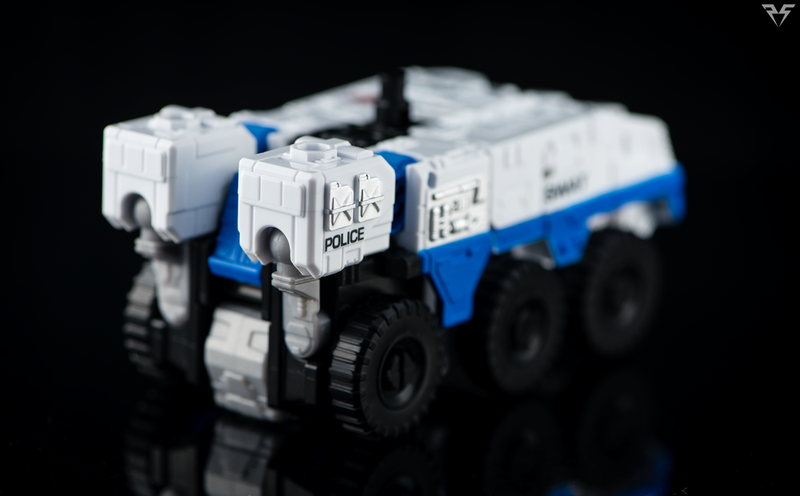 Rooks Vehicle mode is a blocky, brick on wheels of an APC. Looking at home with a S.W.A.T. team or a special forces unit deployed deep in enemy territory more than a team of rescue vehicles Rook is one fierce looking Autobot. Rook is unique in that he has a 6 wheeled alt mode instead of the usual 4. The mold would look at home with treads but I think the wheels do a good enough job for the “All Terrain rescue vehicle” that he is disguised as. Rook looks intimidating, but without any real overwhelming offensive qualities I feel he does a good job of representing a member of a rescue team despite the military aspects of his alt-mode. Rook unfolds into a barrel-chested bruiser of an Autobot. He’s got cannon/tool ports sculpted into his hands (nullifying the 5mm fist hole) that allow for some interesting interaction with 5mm accessories. He has ankle tilts… I REPEAT HE HAS ANKLE TILTS! A COMBINER WARS DELUXE HAS ANKLE TILTS!!! (Good news for the Swindle and Hound retools down the road… I’ve heard Brawl will have ankle tilts as well ) Not everything is perfect in Leg Town however… he’s got some crazy hollow lower legs that could really benefit from a flap or some other bit of plastic covering the giant holes. He’s got a backpack but he wears it pretty well and it really doesn’t hinder too much of his posability. Other than the ankle tilts (I did mention he had ankle tilts right? ANKLE TILTS!!!) His posability is pretty standard for a combiner wars deluxe. His backpack can hinder his legs moving backwards the full range but it can be adjusted out of the way if needed. 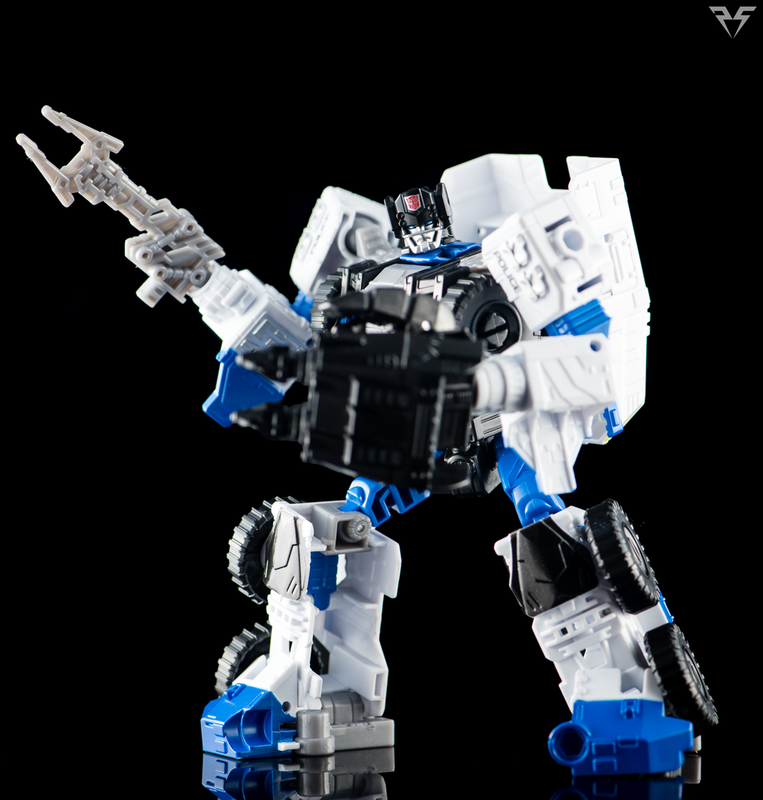 Rook comes with a new weapon, a Taser/claw style weapon that can be plugged in to his 5mm fist ports. The weapon can also be stored on his backpack in bot mode. One of the coolest aspects of Rook’s unique 5mm front facing fist ports is the ability to equip the Combiner weapons as “Hulk Hands” for Rook to lay the smack down on unsuspecting Decepticons. He can wield the one he comes with, and with the help of one of his Protectobot friends he can equip a pair of combiner fists that are the size of his chest! The combiner weapon can also be stored on his backpack in bot mode. 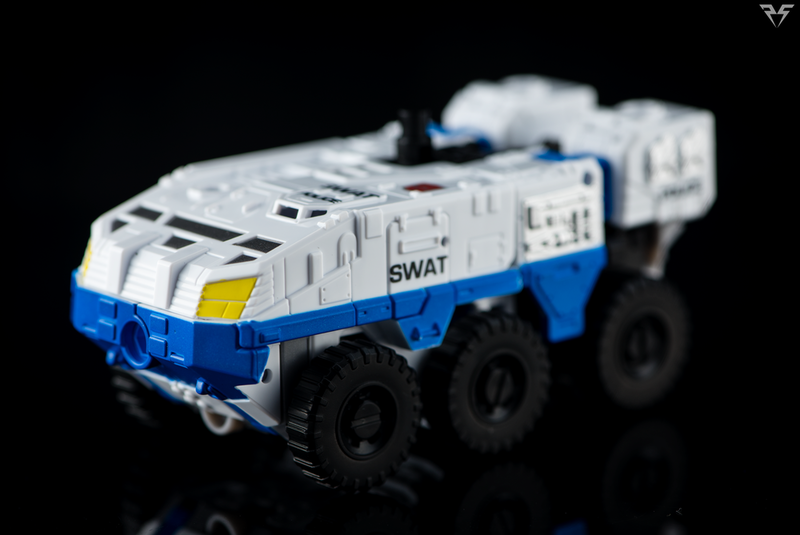 In vehicle mode there are a number of ways the weapons can be stored or used. Check out the gallery to see some of the things I managed to think up, I’m sure there’s plenty more ideas out there! Rook’s Combiner Weapon is unique in that it has a 5mm port on the palm to allow it to mount flat on Rook’s alt mode. This means if you really wanted to get silly you could strap 2 Rooks to a combiners feet as roller-skates! 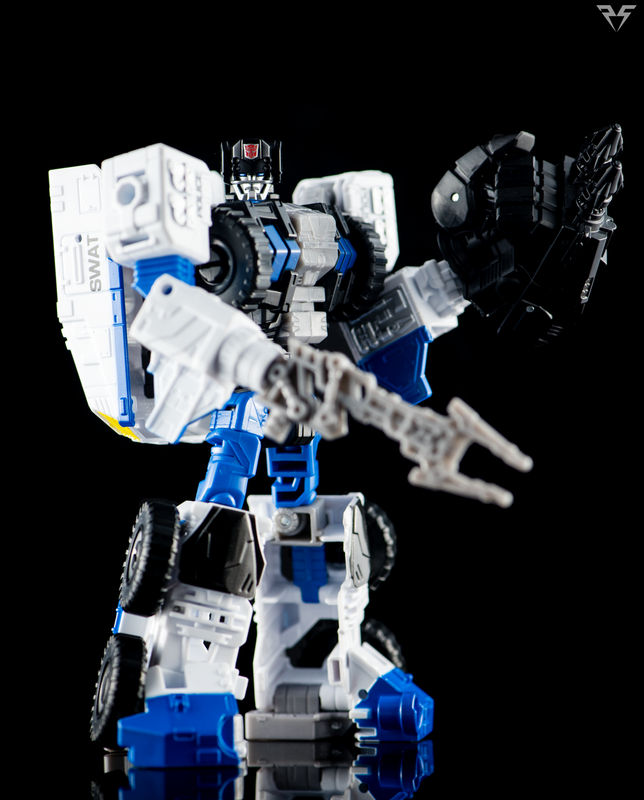 Rook is a really fun new mold added to the Combiner Wars line up. While most of the Protectobots have been a sort of “Best of” series of retools and remolds Rook brings some fresh fun to the lineup. He’s has some great playability in both modes and looks great as an APC or an Autobot warrior. I’m looking forward to seeing Hound and Swindle being made from this mold!